Enter to win a free ticket before January 7! EastWest Sounds returns to the music industry’s premier trade show to present their catalog of critically acclaimed virtual instruments. 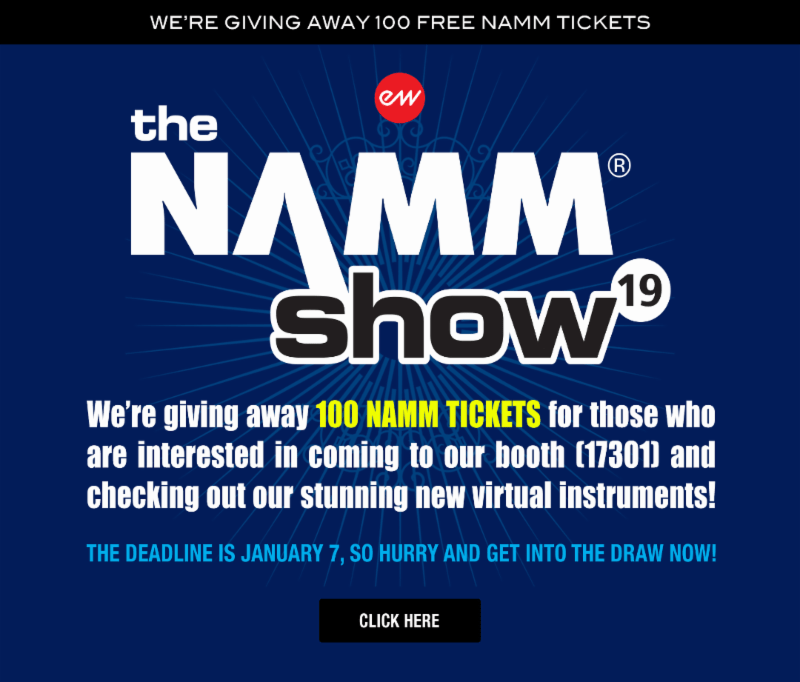 NAMM visitors will have the unique chance to experience a brand-new MYSTERY product that will be unveiled at the show for the very first time! At the booth, visitors can check out ComposerCloud, the #1 subscription service for musicians that has revolutionized the virtual instrument industry. ComposerCloud gives access to over 40,000 EastWest virtual instruments (starting at only $19.99/month). Additionally, the company will present their newest virtual instrument, VOICES OF OPERA, featuring the sensational vocals of soprano LARISA MARTINEZ (Andrea Bocelli) and tenor CARLTON MOE (Phantom of the Opera). Interactive kiosks will allow show attendees to play and listen to the existing and most recent releases such as VOICES OF SOUL, SPACES II, VOICES OF THE EMPIRE, HOLLYWOOD CHOIRS, and so much more! Winners will be selected in a draw on January 7 and will be responsible for any other costs associated with attending.